By far, color print film is the most commonly used film in the world by both amateur and professional photographers. It has the widest range of brands and speeds. The film is very handy to use because commercial processors are very commonplace and quick. Color print film is a handy and convenient way to take photos. With good exposure latitudes print film can be very forgiving in tricky lighting situations. It must be said though that the print that comes back from the processor is NOT THE ORIGINAL. The negative is the original image that many, many copies can be taken from. Many people discard the negatives only to realise later that they need a copy of that image. 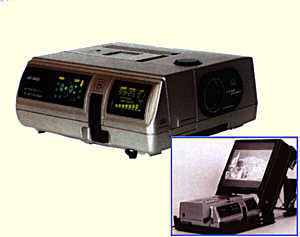 The major advantage of slide film is that it is the original image that is viewed on a projector or by other means. This means that the best rendition of the scene is recorded without subtle alterations made in the printing or copying stage. The secret to good color prints is in the printing. A good photographer can get their exposures and focusing just right, but if the printing isn’t up to scratch, their efforts aren’t noticed. Commercial processors do a fair job on the whole with enprints, but to really recognise how good the image is the printing has to be impeccable. The best results come from professional printing labs that print the images by hand. DIY color printing is an option but this can prove quite expensive and time consuming. 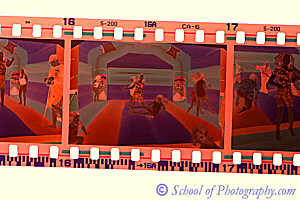 Processing your own slide film is both relatively easy and economical, unlike printing color prints from negatives. Although the initial outlay for equipment can be a drawback. The disadvantages to slide film are obvious as soon as they come back from the processor. In order to see slide images at their best they must be projected. This can prove a very tedious task. Another downfall is their poor exposure latitude. 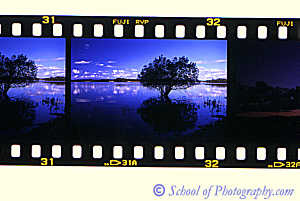 Print film, in most cases has about a 2-stop latitude in under and overexposure. Slide film only has about 1/2 stop latitude, so exposures have to be taken much more carefully. Having said this if the photographer is well practiced in accurate exposures, this shouldn’t be a problem. It is also possible to get prints from slides; there are two ways of going about this. One way is to get the slide copied onto print film. Some processors do prints from slides through this method. The results though can vary depending on the slide and they rarely match the results of the next method. This method is printing straight from the slide onto positive chrome paper. Only a few manufacturers produce this paper. The best-known positive printing process is Cibachrome. The results, when printed successfully cannot be matched. This type of printing paper is often used for exhibition purposes. When choosing between print and slide film a major consideration is how the images will be used. If the images to be taken are for family and friends viewing, print film is the obvious choice. The enprint is ideal for passing around or filing into an album for viewing. This saves the hassle of setting up projector and screen, allowing would-be viewers time to make their escape!! Slide film is more suited for serious photographic work. Images that are to be used for exhibition to large groups, whether it is for a work project or a photographic club. Prints from slides are also usually much better quality for exhibiting. Images that are to be shown photo libraries or magazines should only be taken on slide film. Most of these organisations will not entertain prints.